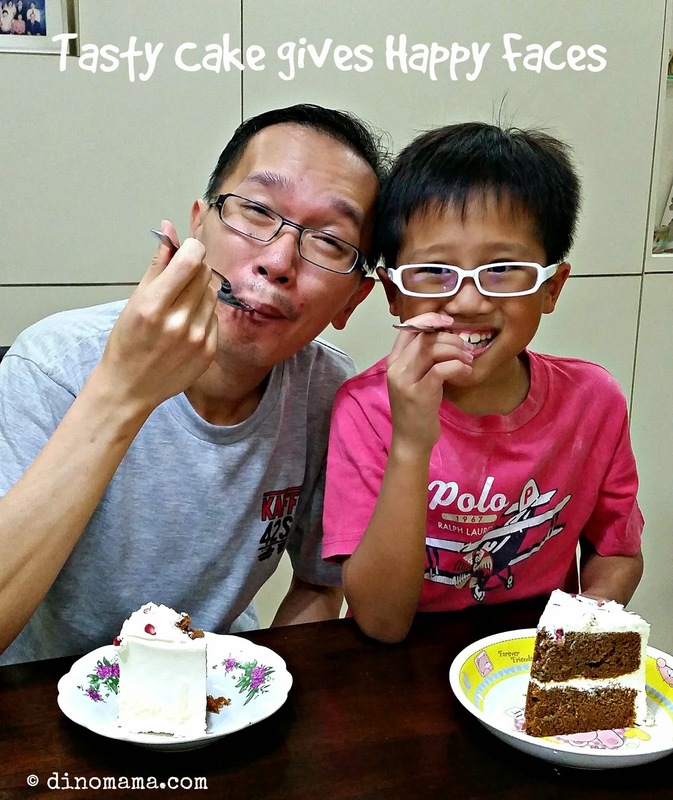 In our family, we have always celebrate every one's birthday, Mother's Day and Father's Day with a cake, mum will whip up some yummilicious food and we will enjoy the cake after the sumptuous dinner. After Dad passed on a decade ago these celebrations ceased to a stop *sigh* then Mum got ill, we tried to cheer her up and did a small birthday celebration for Sis. That was the last cake we have in the family. It's been 2 years since Mum left us, I guess I am still grieving her passing even though about 10 months ago I told my friends that I am done missing her and are ready to step out. I guess I wasn't ready yet but now I think it's time I let go because only by letting go I can finally move forward. 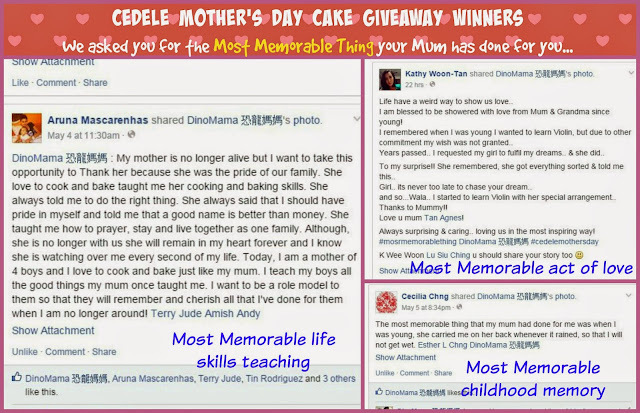 With Mother's Day approaching, I was prepared to let this day pass by as with other days but when the wonderful people from Cedele wrote to me saying that they would like to send me a cake to me for Mother's Day I immediately said YES PLEASE! I know Mum will be happy to know that this time I am really trying to let go. So I came home to this beautiful cake - Pomegranate Zucchini Cake. Okay, I know what are all of you thinking at this moment... plain bland watery zucchini in a cake and as if that is not enough it is paired with the sweet juicy pomegranate, a weird combination that makes those who heard of it for the first time a frown or a scrunch up face (if you are not zucchini fan) with "Are you sure? Seriously?" Alright at least I said those words when I first read the name of the cake. On the other hand, I know also that this is a great cake ONLY because of these 2 ingredients, let me tell you the reason. Well, we all know it is usually those ordinary looking fruits or vegetables that are packed full of nutrition. Zucchini, as plain and simple as it looks, is one of these fruit. Besides high in water content, it is also low in calorie count and rich in fiber, thus it is a great fruit to eat or include in your meals if you are on a diet. Pomegranate on the other hand helps lower blood pressure & stress level, , has high level of antioxidants, helps digestions, prevents heart disease and most importantly it aids in the regeneration of cells, slows down aging thus making you look younger. Wow~ this alone will make me try to include pomegranate more in my diet. When I open the box I was captivated by the cake! The bright red pomegranate seeds scattered over the cream background, makes me think of sakura flowers, pretty to the max~ When I sliced the cake I was surprise to see a thin layer of cream instead of thick ones like those I always tasted before. 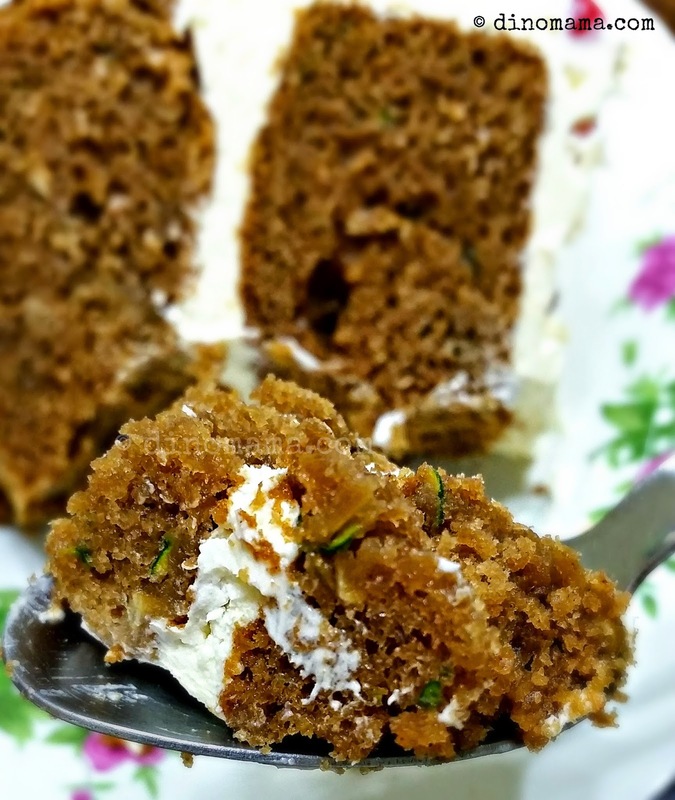 Here's a close up photo of the cake, you can see tiny thin bits of zucchini, and you noticed that the cake is dense instead of fluffy and soft. Here goes... I'm going to take my 1st bite of the cake. Oh pardon me! That was a delicious heavenly mouthful of cake! There are so many flavour in my mouth! Biting into the dense cake that is not too sweet, mixed with the zesty lime cream cheese frosting and the exploding pomegranate with the juice squirting inside my mouth. 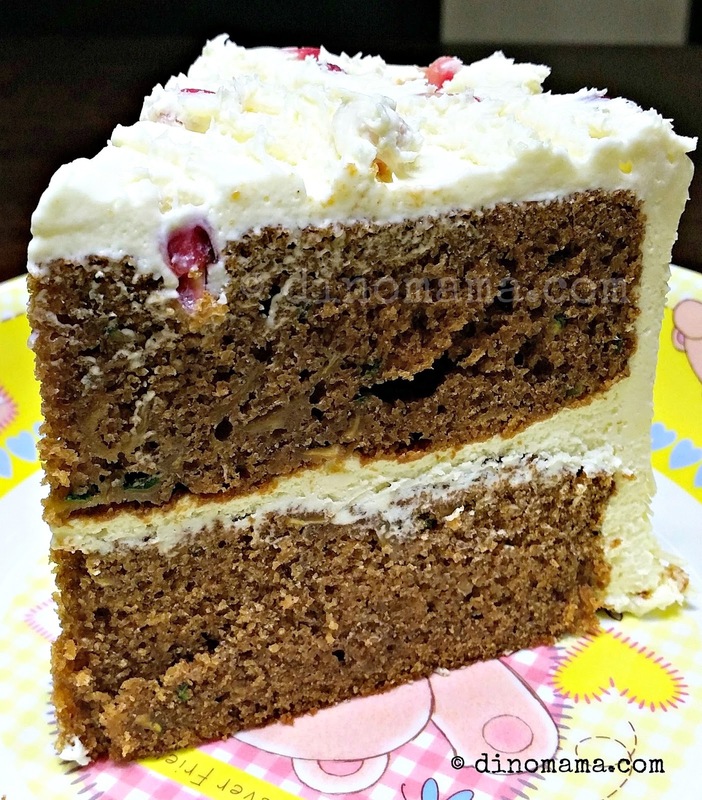 The white chocolate flakes at the bottom of the cake adds a little bit of crunch to the cake. Best part, I couldn't taste the zucchini! Now those non zucchini fans can have the cake and enjoy the health benefits of it. The Pomegranate Zucchini cake is baked with grapeseed oil and organic unrefined sugar. So healthy can! As you can see, the boys enjoy the cake too! DinoPapa took a bite of the cake while DinoBoy attacked the frosting, both only managed to say "Mmmm~~" as their mouth were too busy eating the cake. Oh another thing, because its a dense cake, it can be quite filling. I made a mistake of slicing too big a piece for each of us and we ended up couldn't finish the slice at 1 go. Cedele does not only have cakes, they have a variety of pastries and bread too, check them out over here. If you want to give Cedele cake a try, either contact them or visit them to find out more, just remember that they need at least 3 days advance notice for ordering the cake. I have shared in my facebook page last week that this week will be an exciting week for my readers. YES! Giveaway for you all! 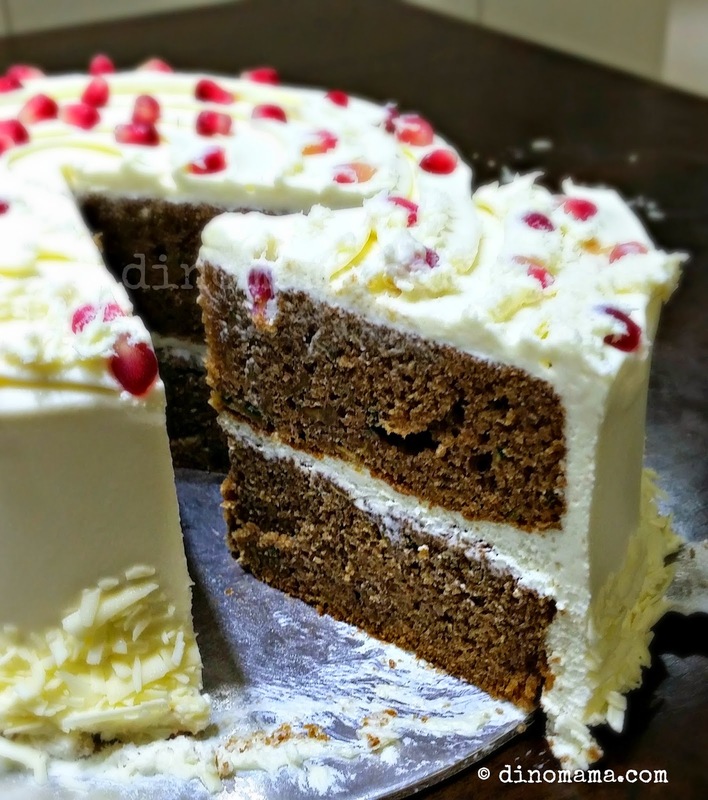 We were given the Pomegranate Zucchini Cake with no obligations to blog about it but we think the cake has such a unique taste that we want our readers to have a chance to taste it too thus we asked Cedele if they are able to sponsor the cake for our giveaway. They obliged! So 3 lucky readers are in for a treat! And because its for Mother's Day, time is a little bit tight so this will be a Flash Giveaway. 1. Like and Share our post in your facebook. 2. In your facebook shared post, tell us about the most memorable thing your Mum had done for you in your facebook. 3. Tag at least a friend in your facebook shared post to tell them about this giveaway. 4. Tag us @dinomama, remember to set your post to "public" otherwise I will not be able to see it. 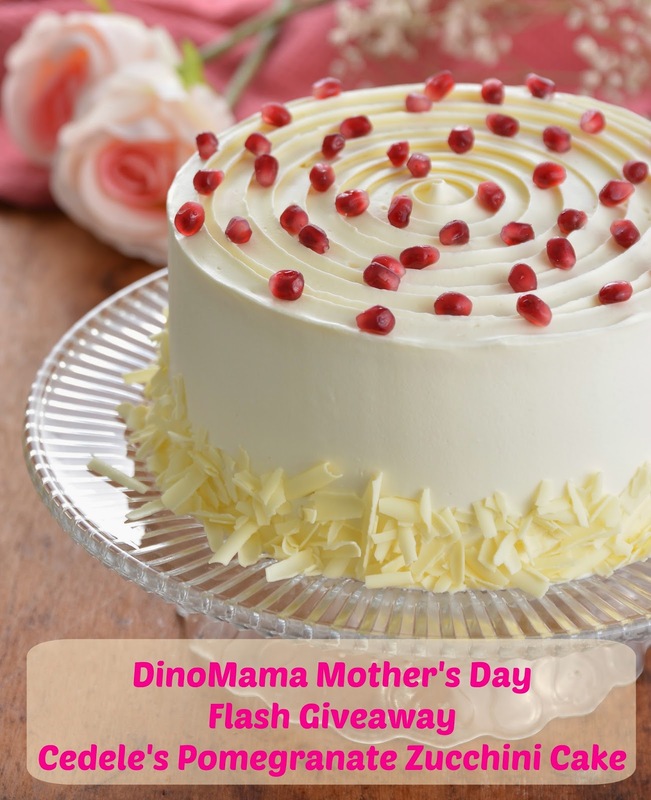 - The DinoFamily will read all entries and pick the best three entries as winners. - Winners will be notified on the shared post in their facebook and have 24 hours to respond. 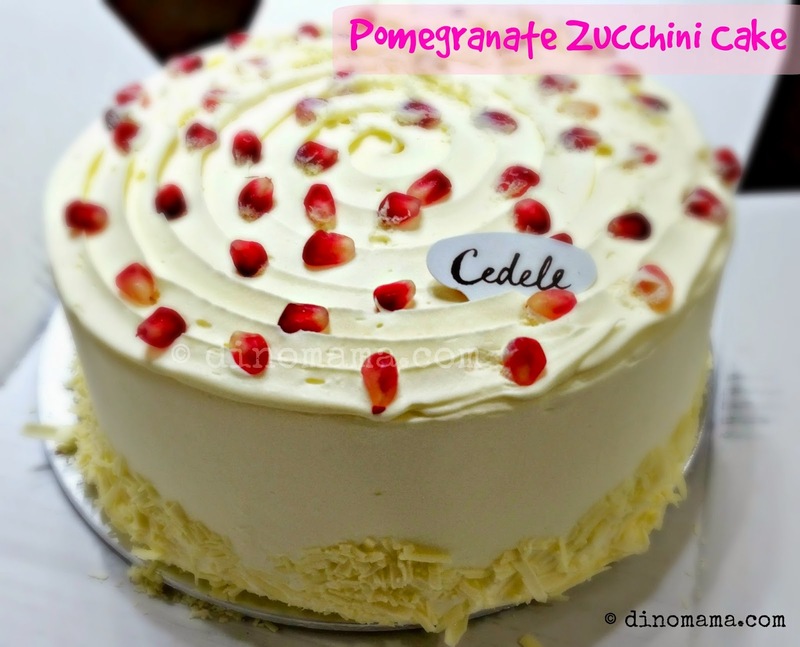 Disclaimer : We are in no way affiliated to the management of Cedele or The Bakery Depot Pte Ltd. We received the Pomegranate Zucchini Cake for tasting only but decided to blog about it. All photos in this post, otherwise credited, belongs to The DinoFamily, you may not use them without our permission. My mother is no longer alive but I want to take this opportunity to Thank her because she was the pride of our family. She love to cook and bake taught me her cooking and baking skills. She always told me to do the right thing. She always said that I should have pride in myself and told me that a good name is better than money. She taught me how to prayer, stay and live together as one family. Although, she is no longer with us she will remain in my heart forever and I know she is watching over me every second of my life. Today, I am a mother of 4 boys and I love to cook and bake just like my mum. I teach my boys all the good things my mum once taught me. I want to be a role model to them so that they will remember and cherish all that I've done for them when I am no longer around!